A job in the waste disposal industry is more diverse and multi-facetted than one might think at the outset. A good technical and metallurgical knowledge is particularly important in the scrap and metal industry. These are, of course, not basic prerequisites for employment in our company, but a certain degree of technical affinity is always welcome, particularly in the case of professions such as metal workers, forklift operators, excavator operators or truck drivers. 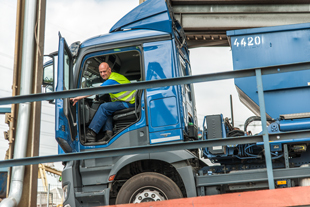 C1E/CE with professional experience in set-down and roll-off tipper trailers. Good technical knowledge of vehicle care and maintenance is required. We offer a safe workplace in a highly-motivated team with performance- based salary model and the latest technical equipment. We expect an independent and reliable way of working, with a quality and service-oriented approach. Please send us your application with your salary expectations and your earliest possible start date.